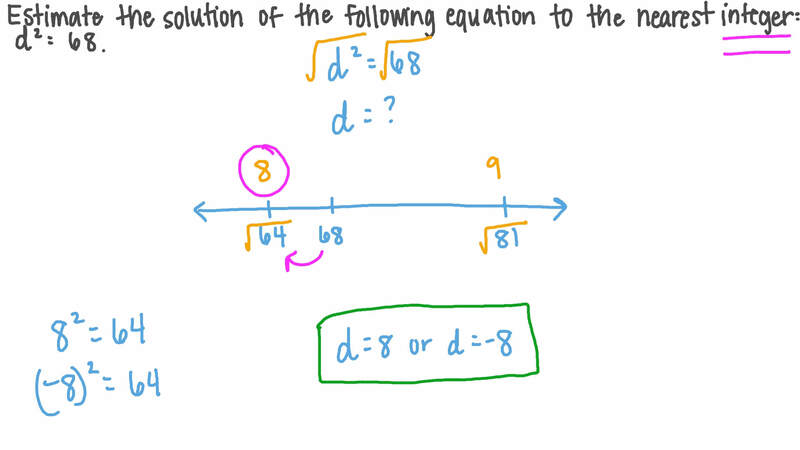 In this lesson, we will learn how to estimate square roots. Which of the following numbers is closest to 5? The formula for the area of a square is 𝐴 = 𝑠 2 , where 𝑠 is the side length. 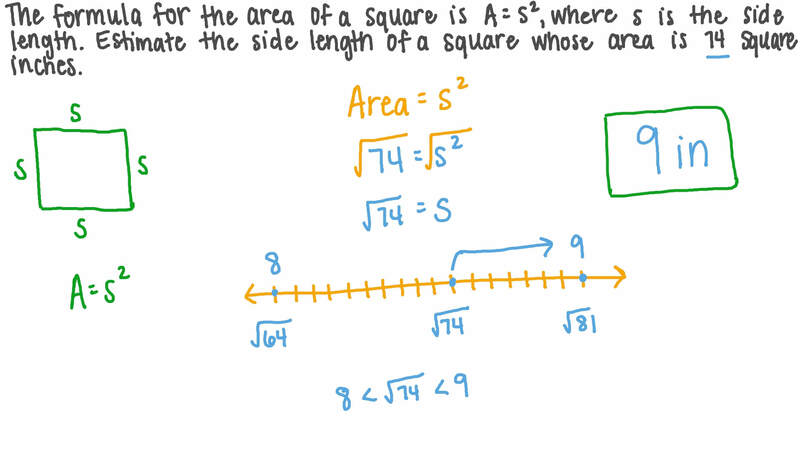 Estimate the side length of a square whose area is 74 square inches. By estimating the values of the square roots to the nearest whole number, order the following from least to greatest: √ 3 8 , 7, √ 8 8 , 4. Estimate √ 1 2 7 to the nearest whole number. Estimate  4 3 3 1 0 to the nearest whole number. Estimate the solution of the following equation to the nearest integer: 𝑑 = 6 8 2 . What is the largest integer 𝑎 such that both 1 𝑎 and 𝑎 √ 4 6 3 are between 0 and 1? Given that 𝑥 ∈ ℤ + and 𝑥 < √ 1 5 < 𝑥 + 1 , find the value of 𝑥 . Without using a calculator, find two consecutive integers that √ 1 3 + √ 6 lies between. Arrange the following numbers in descending order: √ 3 3 , − √ 2 2 , √ 4 1 , 3 , 0 , √ − 1 2 5 3 . Arrange the following numbers in ascending order: √ 1 2 9 , − √ 9 1 , √ 4 9 , 5 , 0 , √ − 1 2 5 3 . Arrange the following numbers in descending order: √ 8 3 , 1 , − √ 8 9 , √ 9 7 . Find an approximated value of √ 5 7 − 4 0 without using a calculator. Find the two consecutive one-decimal-place numbers that √ 1 5 1 lies between. The positions of the numbers √ 1 2 0 , √ 1 0 2 , and √ 1 1 1 have been identified on the number line. 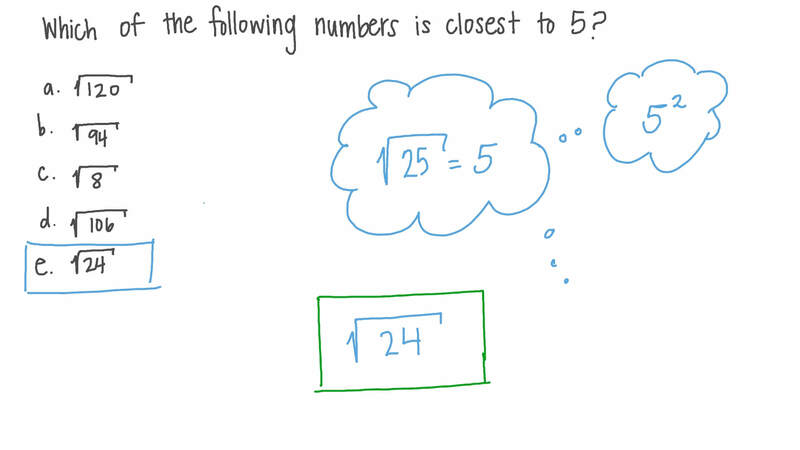 By considering their size, decide which number is represented by 𝑎 . The positions of the numbers √ 2 4 , √ 1 7 , √ 2 2 , and √ 1 9 have been highlighted on the number line. Which arrow represents the position of √ 1 9 ? The positions of the numbers √ 2 4 , √ 1 7 , √ 2 2 , and √ 1 9 have been identified on the number line. Which arrow represents the position of √ 2 2 ? Fady is trying to find which two whole numbers lie on either side of √ 5 1 . He decides that it will be helpful to use what he has been taught about square numbers. What is the greatest square number below 51? What is the smallest square number above 51? Hence, determine the two consecutive whole numbers that √ 5 1 lies between.